Zoho Corp. has a new online service, Zoho Expense. I had a chance to play with Zoho Expense while it was in beta and was quite impressed with it’s features and capabilities. While it’s a great tool for recording and tracking individual expenses, where it really shines is as a company-wide expense reporting tool. It’s well worth a look. Drag and drop receipt images into the receipt section. Once the receipt is uploaded the image is converted to text and details such as date, merchant name, amounts, etc. added to the expense entry. Images may be in PDF, JPEG, PNG, or DOC/DOCX formats. I’ve haven’t had a chance to test this feature extensively yet, but I’ll go out on a limb that some receipt formats may not parse well and will still need to be manually entered. 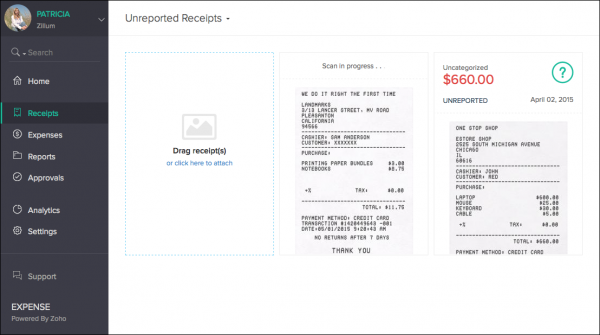 You can upload up to 20 receipts at a time. Or you can scan and attach to the existing expense entries. You can upload from (or download to) many cloud services, including Zoho Docs, Dropbox, box, Evernote, Google Drive, and OneDrive. Credit card transactions can be fetched daily, so there’s no need to re-enter credit card charges into Zoho Expense. Mileage rates are set by the administrator when the system is set up, and can be easily adjusted when reimbursement rates change. The amount of reimbursement can be based on distance travelled or odometer reading. 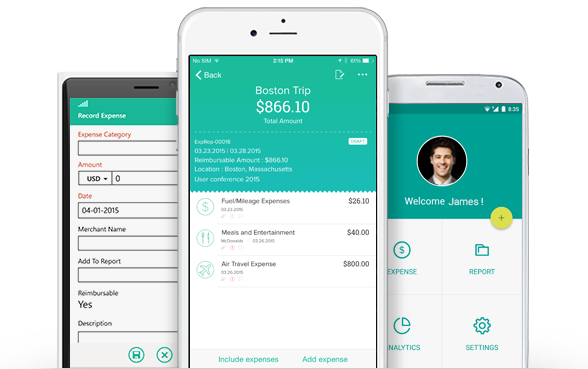 With the mobile app it’s easy to record expenses on the go, so they don’t pile up for the dreaded monthly expense report. Download apps at the iTunes App store, Google Play, and Windows phone store. Whether on a mobile device or computer, Zoho Expense has an intuitive interface that’s easy to navigate. Zoho has made every effort for using Zoho Expense to be, well, effortless. Zoho Expense makes it easy to comply with company reimbursement and approval policies. At their discretion, managers can approve or reject expense reports with a click of a button (and can even override policy violations such as spending limits or expired receipts). Set rules for amount limits on expenses (for example, manager’s approval needed over $200.00). Record and calculate advanced payments. Send notifications for reports due for approval, when comments are added to a report, or reports approved or rejected. Submitter and Approver can sign the expense report online using DocHub, then email or save to PDF. Collaborate easily using the notifications. A comment in the report can send a notification to the submitter, who can view the report from the email and make immediate adjustments. It’s just that easy. All expenses are categorized, so you can get insights into all aspects of expense records. You can check expenses by category, by user, and by merchant, among other parameters. You can even see if anyone makes a habit of late reports, exceeding approved amounts, or other “but I’m special” exceptions. Using the dashboard to get a snapshot of outstanding reports, rejected reports, and report awaiting reimbursement. 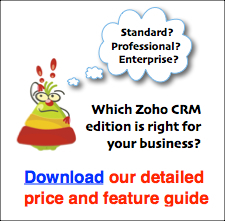 Zoho Expense integrates with Zoho CRM and Zoho Books. 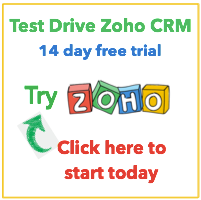 Zoho CRM: Import Zoho Expense users from your Zoho CRM account and easily assign roles. Zoho Books: Automatically import approved expenses into your Zoho Books account. Subscribers can record an unlimited number of expenses and save and/or associate an unlimited number of receipts. The $15 per month price tag includes 10 users, with additional users just $2.00 per user per month. Or pay annually to get two months free. Organizations with greater than 100 users can get special pricing through Zoho Corp. There is a 14 day free trial to take it for a test drive. One fairly obscure gotcha’: when I was trying to get Z Expenses set up on my Android, I kept getting an error that “The account isn’t active”. Turns out at some point along the line we deleted Contacts from our Zoho Accounts and it’s required to run this service. It’s quite unlikely you’ll find yourself in the same boat – most folks wouldn’t have messed about that deeply in an account. But, if you get that weird error message, let me know in comments and I can help; I now know how to fix it! Go ahead and check out this service for your company. It’s easy to navigate and quickly understand what to do where. Or, check out the Zoho Expense “Welcome” page for a basic how-to reference. If you’d like to get started with a trial, you can do that right here.